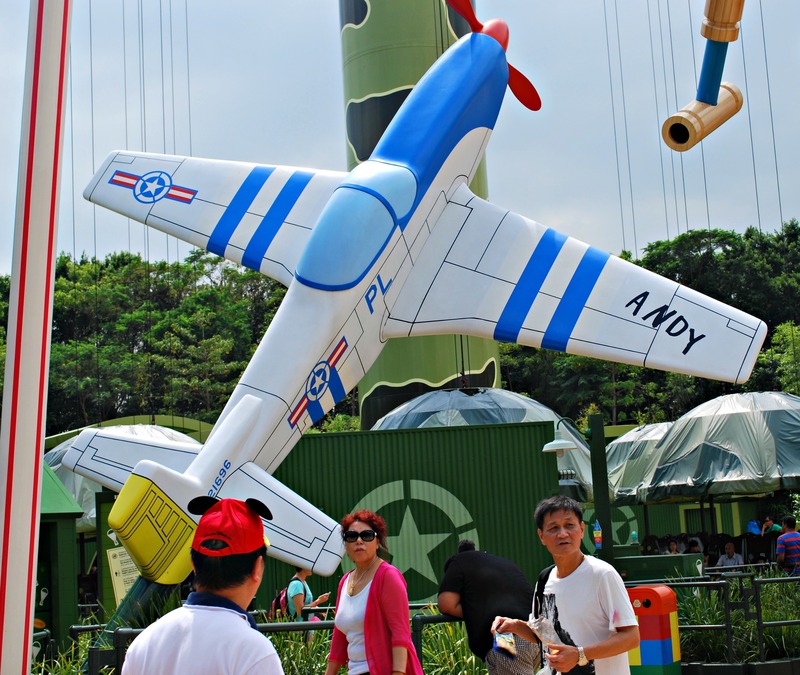 *Notes: Hong Kong Disneyland Website, one of the park’s 7 themed areas, added to the park in 2011, based on the Pixar film “Toy Story and features characters from the movie, guests are made to feel as if they have been shrunk down and are playing in Andy’s backyard. When M first suggested that we take a side trip to Hong Kong during out 2013 Japan trip, my initial thought was: Yay, Hong Kong Disneyland! Anyone who knows me is well aware of what a Disney nut I am. I have been to the Anaheim Disneyland more times than I can count and try to go to Disney World in Orlando at least once a year. And Hong Kong Disneyland definitely did not disappoint! Although small compared to Disney’s other parks, it has some fabulous rides that are not available anywhere else such as Mystic Manor and Big Grizzly Mountain Runaway Mine Cars. 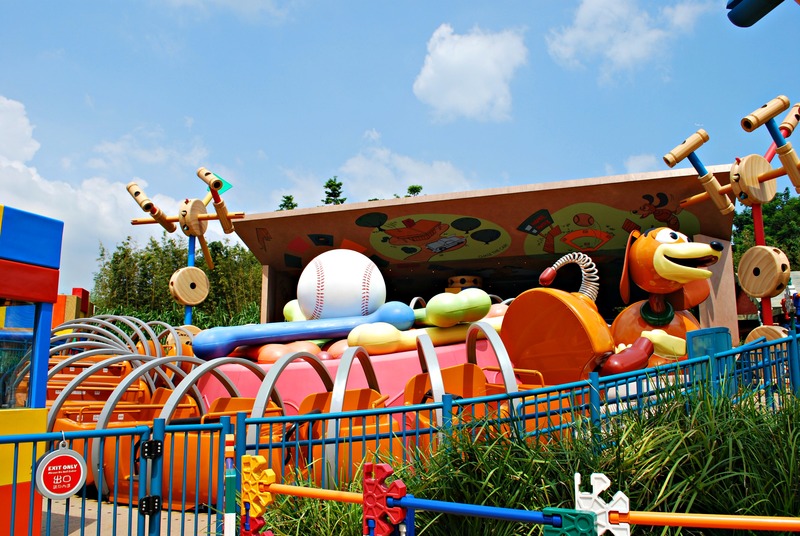 Then there’s Toy Story Land. 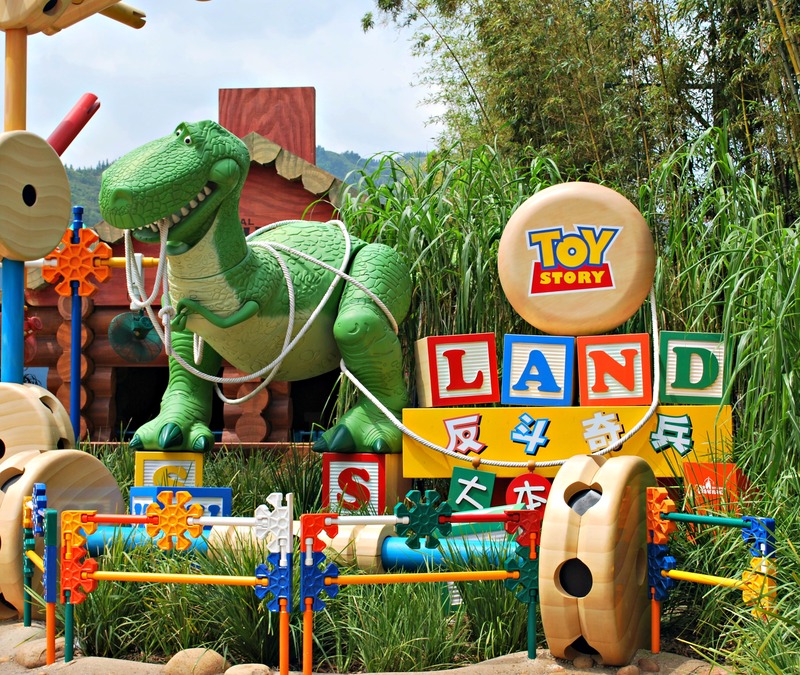 Based on Pixar’s popular film, “Toy Story”, this charming area was perhaps the highlight of my day at Hong Kong Disneyland. 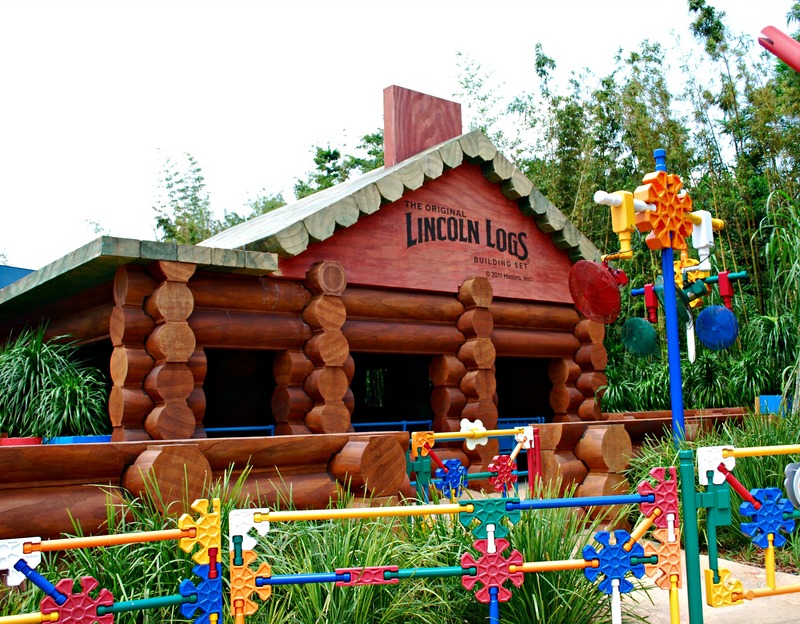 Themed to the hilt, guests are made to feel like they have been shrunk down and allowed to play with all the oversized toys in Andy’s backyard. And it only got better the further in we went. Wherever we looked, there was a new toy to “ooh” and “ah” over and take a gazillion pictures of. 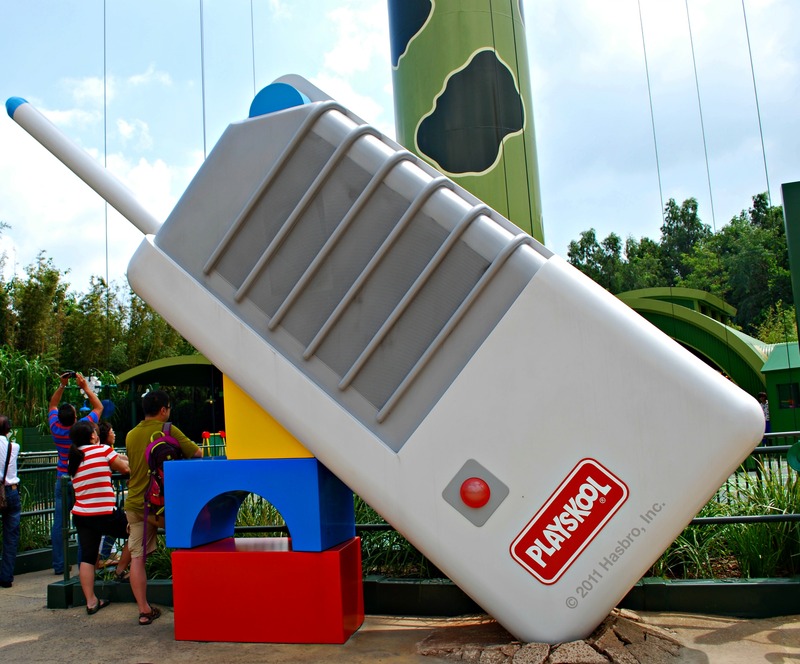 I went especially gaga over the Lincoln Logs house and the giant walkie talkie. I remember playing with both constantly as a young girl. 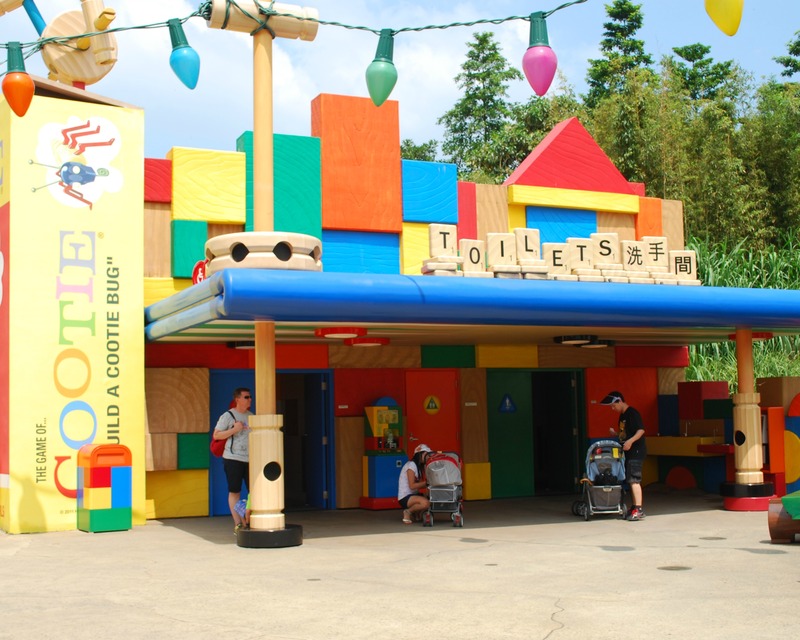 And even the building housing the restrooms as well as the benches were in on the Toy Story theming. 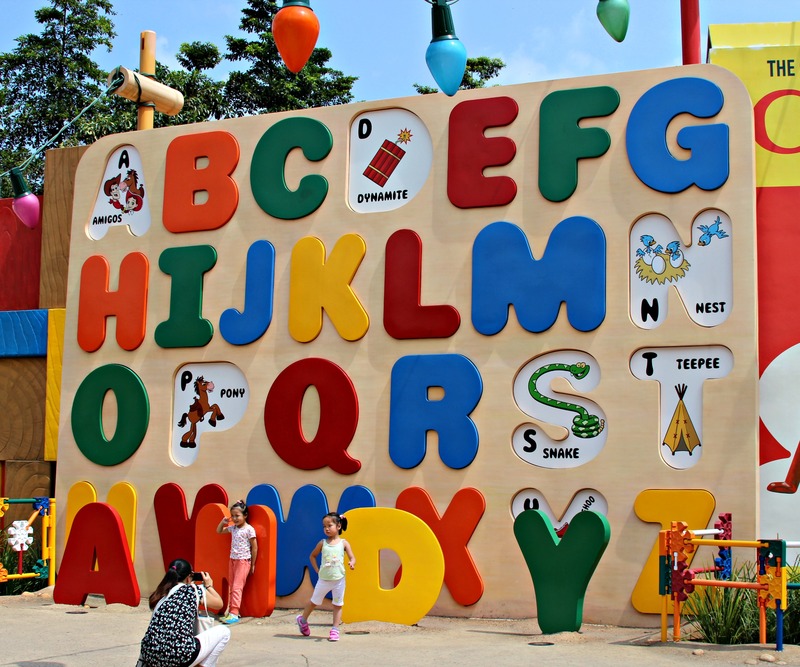 The former was made to look like it was constructed from colorful toy blocks with a sign in Scrabble tiles reading “Toilets”. 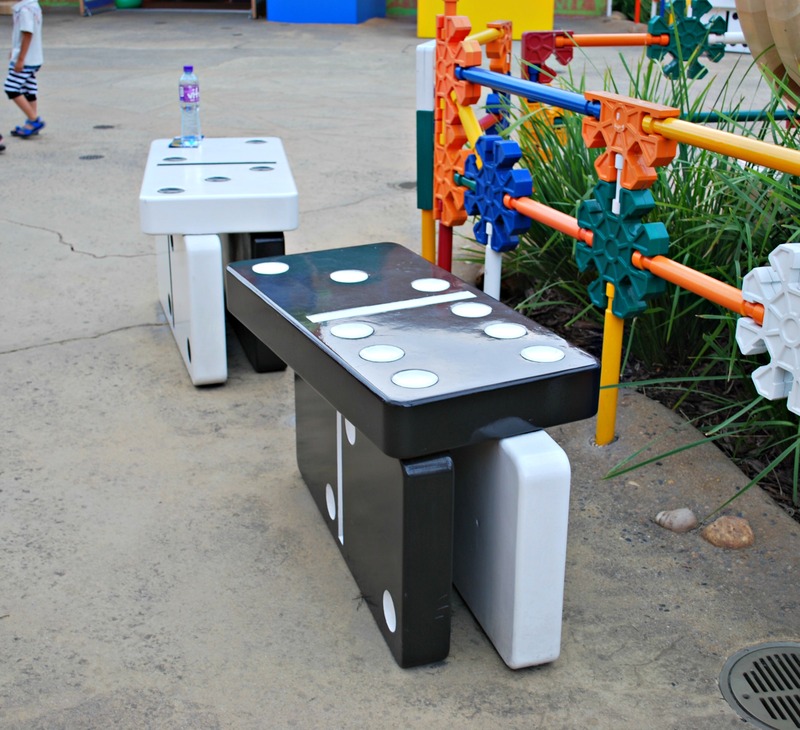 As for the benches, one set looked like it was made out of popsicle sticks and the other dominoes. They were too adorable to even sit on! Of course there were rides, although we didn’t go on any of them. It seems that the older we get, the more nausea we experience after riding on anything that 1) goes in a constant circle, 2) goes up and down, up and down, up and….., 3) gives one the sensation of swinging back and forth. And ironically enough, the 3 rides in Toy Story Land had the unfortunate (for us) distinction of falling into these categories. 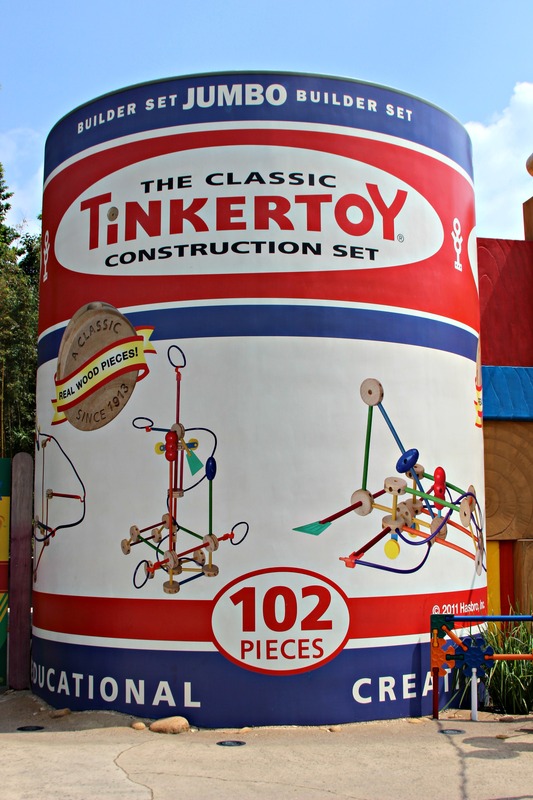 There was the Toy Soldier Parachute Drop (up and down), RC Racer (swinging back and forth) and the Slinky Dog Spin (around and around she goes). But we weren’t too terribly disappointed about not being able to go on the rides. The rest of the land more than made up for it. I think the best part is that we were both able to experience a degree of nostalgia that we had perhaps not felt in quite a while. 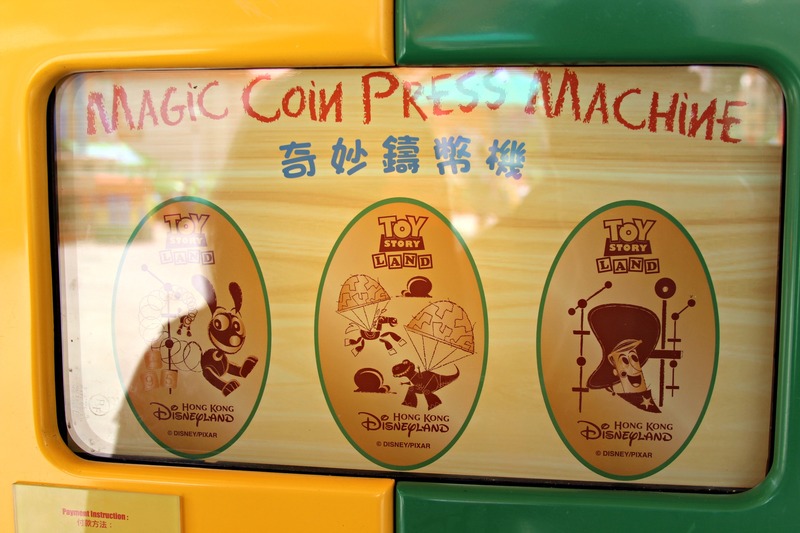 Before heading off to Fantasyland, I bought some pressed tokens as a souvenir of our time there. 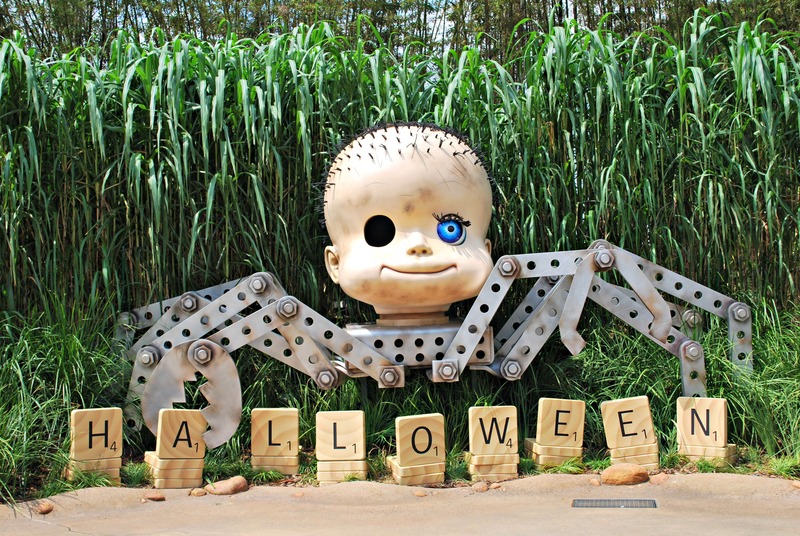 Then, as we strolled along the long pathway taking us away from Toy Story Land there was one last surprise toy hiding in the tall grass……Spiderbaby was there to wish us a happy Halloween! Love this! Toy Story is one of my favorites. Mine too! It was like being transported right into the middle of the movie. I think a lot of people would agree with your husband. I’d heard from numerous sources that Hong Kong Dland is very rinky dink and small and you can finish the whole park in a single morning. But I really enjoyed my time there and since there was hardly anyone else there, the waits averaged only 5 minutes or so! I’d still love to go to Ocean Park someday, I’ve heard nothing but good things. And hopefully, you will be able to come down to So Cal sometime soon and go to the Disneyland here. Always wanted to visit Disneyland overseas, whether it was Hong Kong or Tokyo! Loved this piece! I hope you’ll get to go one of these days! Hong Kong Disneyland was small but quite charming and they had some really great rides. Love Disneyland! Spiderbaby looks freaky! I know, Spiderbaby was pretty freaky looking! The perfect toy to wish us a happy Halloween. How could you NOT go on any of the rides? That would have driven me nuts. Love your photos. This area of the park looks so wonderful! Yeah, it’s sad how I now get so dizzy from rides that follow a repetitive track. Especially the ones that go in a circle, I would have been sick for the rest of the day if I went on the Slinky Dog Ride. I wished if I could “Liked” 10 times more at least!! Toy Story is my most favourite Disney animation and I adore all of the characters. Even though I am a grown-up, they are just so cute and their adventure is so funny. Watching their movies is my secret joy when Paul is not around. 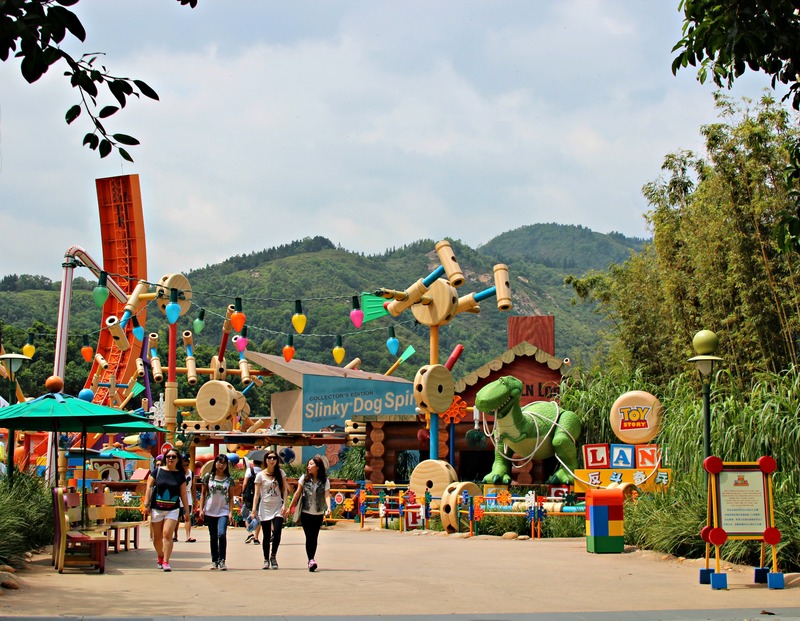 Therefore, Disneyland Hong Kong’s Toy Story Land sounds like a dream comes true to me. Did you find anything interesting in the gift shop? Or was there any Disney food with Chinese twist in the restaurant? About amusement park rides, I agree with you entirely. I used to love all those adrenalin filled rides when I was in my teens. Since I moved to UK, I have never been to any amusement park. That means no roller coaster. The only ride I have done recently was accompanying my friend’s 5 years old to a tea cup ride in a local fete. 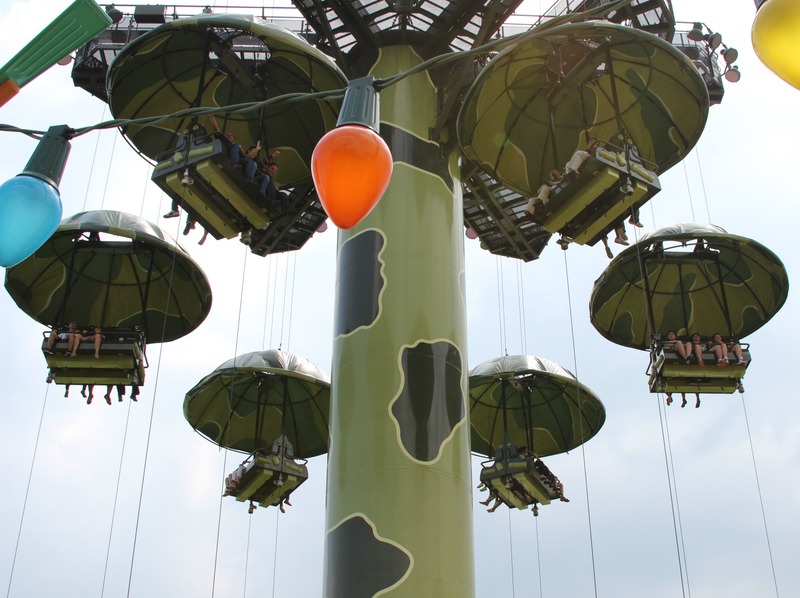 Even that silly ride gave me a queasy tummy – pathetic, huh? Thank you so much! I love Toy Story as well, I still remember when I saw it in theaters a long time ago. I was just blown away by the animation. And being at Toy Story Land was like being transported directly into the movie. I actually didn’t go into the gift shop, I had already bought too many souvenirs on Main Street when we first came into the park, and my backpack was too loaded down to put anything else into it. And, unfortunately, there was no restaurant in this land, just a small store selling some snacks like pizza cones and cookies and frozen yogurt. But there was lots of Chinese food being sold in other restaurants within the park. In truth, I had read about how terrible their food is on numerous message boards. So we didn’t eat very much there. But, we did get some fish and chips at a little takeaway place in Grizzly Gulch Land. It might be the worst fish and chips I’ve ever had! As for the tea cup ride making you queasy, not silly at all! The last time I went on the teacups ride at Disneyland, I was green around the gills by the end of it. 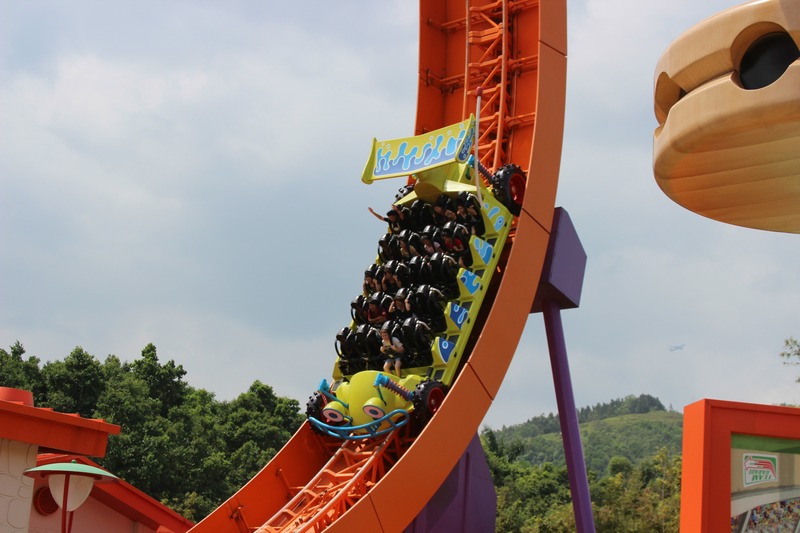 Hard to believe that I once loved that ride…..
How lucky are you to be able to visit HK so often! I’ve been having cravings for real Cantonese dim sum and wonton noodle soup as of late. I had read on several message boards that HKD’s food was overpriced and terrible so we didn’t eat too much while we were there. What we had was just OK. Price-wise, I remember thinking it was fairly reasonable, especially compared to the food at the Disney parks in America. Now those are real rip-offs! They do check your bags at the door but I don’t remember it being a very thorough job, one could probably sneak food in pretty easily. Ocean Park should be fun, I wish I’d had time to go there too. For the authentic Cantonese wonton noodles, you have to go to the markets but there is no service and tourists find the waiters very rude. This is unfortunate because this is how the Cantonese speak – their intonations are rather harsh! I usually go to Tsui Wah – a cha chaang teng or Chinese tea house for the noodles. They have pictorial menus and the waiters speak some English! Yes, I go up HK often to visit my centurion gran! I love HK – was an expat, still have many friends and connections there. When I was in Hong Kong, I had the wonton noodles at Mak’s Noodles up on the Peak. I hope that’s considered to be pretty authentic because I really did love the food there. Don’t worry I’m used to the Cantonese dialect because I heard it at so many of my friends’ houses growing up. I will need to try Tsui Wah the next time I’m in Hong Kong. What a good granddaughter you are to go see your grandmother so often! Yes, Mak’s noodles are pretty good. I’m not a fan of wontons because I’m allergic to shrimps and I don’t like the taste of bicarbonate sodas in the noodles (the good quality noodles are eggy, but nowadays to cut cost, many vendors uses more bicarbonate soda 😒). Let me know when u plan to visit HK, I can help draft a list of eats there! Thank you so much, I really appreciate your kind offer! I can’t wait to go back to HK some day and eat everything in sight. Since I’ve already seen the majority of attractions that I wanted to cover on my last trip, this would definitely be a foodie trip! And I’ll definitely go during the cooler months because the humidity really kills my appetite. 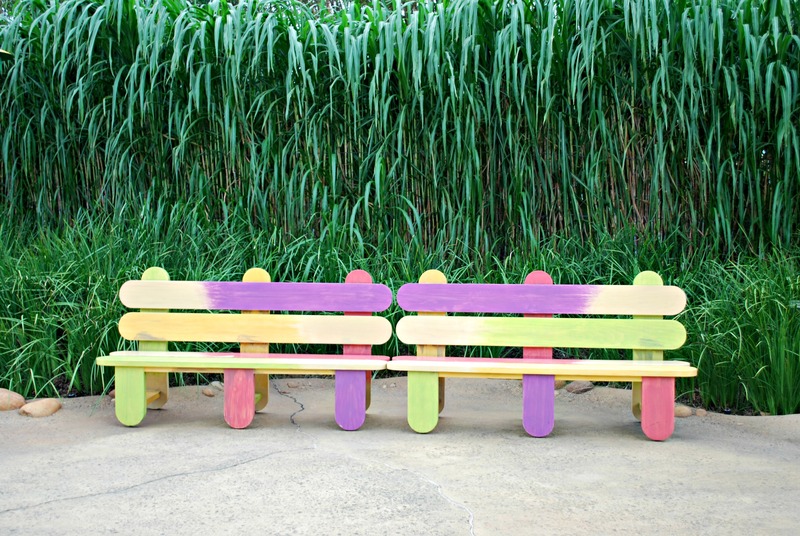 “Spring makes the walls weep and slippery floors”…..this sounds so poetic! Yes, when I go back to Hong Kong it’ll definitely be in the winter time. When we went in September I was dying from the heat and humidity. And how sweet are you to even think about showing me around. I would never want to impose on you like that. But I will definitely be asking you for some good restaurant recommendations, if you don’t mind. I totally trust your judgement! Just returned from HK but it was unfortunate that it was for business. Heard the park was pretty small but from your pictures I would really like to visit there at least once haha. It was very small but I still had a great time. I’ve read on numerous message boards that many people are disappointed when they go to HKD and it seems that only the real Disney lovers get much out of going. Other people have commented that Ocean Park is the better choice. This is such a great blog! I love this review of Toy Story Land. I would love to go to the one at Tokyo Disney Sea also. I imagine it’s pretty wonderful. I’ll keep reading your blog. I’m taking my daughter in a couple of years to visit Japan for the first time (only my second) and I need good tips on what to do and see (other than Tokyo Disneyland)! Thank you so much for your kind comments and for following my blog. Very sadly, I only got to see the outside of Tokyo Disney Sea’s Toy Story Mania. The day that we went (mid-October) was crazy busy and the waits were averaging between 1-2 hours. I’d heard that the actual Toy Story Mania ride was exactly the same as the one in Anaheim so I put it off until the end of the day. Even though there was still 20 minutes before the park closed they wouldn’t let us on, such a disappointment! But it was nice just to see the exterior. So gorgeous, especially when compared to Anaheim’s. This looks so beautiful! I haven’t been to the HK Disneyland yet, because I’ve heard many things about it and well… the Anaheim one is just a 1 hr. flight away! Looks like you had a fun time. I’m guessing you heard some not-so-great-things about HKD. Even before we went, people were warning us not to go saying that they’d heard it was a total waste of time and money. Funny enough, one of the people who was most adamant that we not go was a server we had at a restaurant at the Disney World in Orlando. She was a Cantonese lady who had lived in Hong Kong for most of her life and when we told her we were going to HKD she got so excited (not in a good way). She was ranting and raving about how we would probably have a terrible time because there’s no good rides and the park is the size of a postage stamp and the food is the worst. But despite all the warnings, we were still determined to go and we had a great time. I think one of the best thing was that everyone else who heard those warnings decided not to go because the park was practically empty and there were no waits for the rides! Rides do get tougher the older you get. I used to love roller coasters, now I have to seriously consider it it’s worth getting on one before I do. I know! When I was younger, I would race from roller coaster to roller coaster at Magic Mountain….now you couldn’t pay me to go on anything there! The roller coasters at Disney parks are relatively tame in comparison so I can still do those but I’m nervous while waiting in line and cross my fingers that I will emerge in one piece at the end. 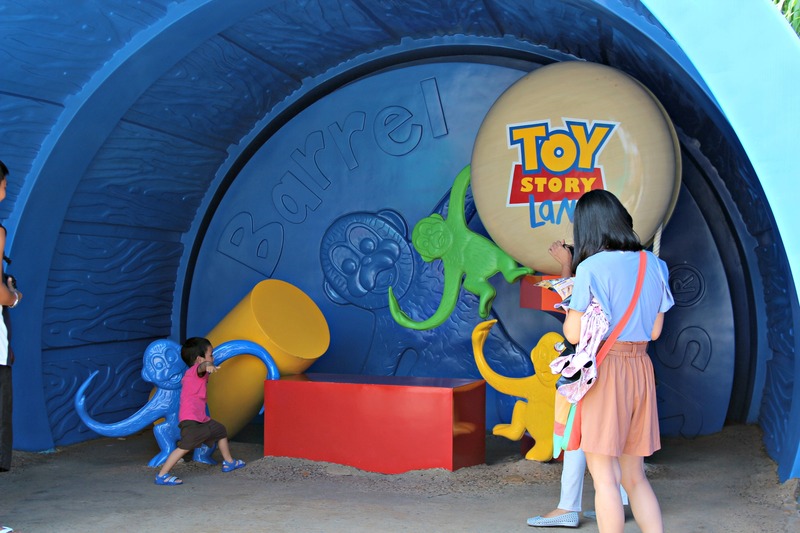 The Toy Story Land sounds so fun! That kind of concept gets me really excited. I heard a lot of great things about Hong Kong Disneyland, and after reading your blog I hope I can go there some day too! 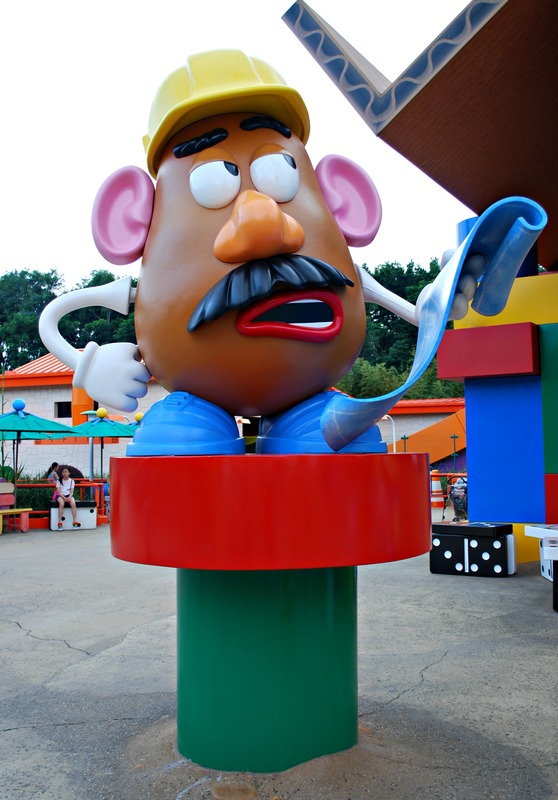 I really liked Toy Story Land, the theming was just awesome there. I hope you will get to go to HKD someday soon. Even though the park is very small compared to other Disney parks around the world, it’s still very enjoyable and I really loved their Mystic Manor ride and the Runaway Mine Cars. I love love love Tokyo Disney Resort! I go there every time I visit Japan and I always put it at the end of my trip so I can finish with a bang. This last time was the most crowded I’d ever seen the parks. Both Disney Sea and Disneyland had waits of 1-2 hours on almost all of their rides. Even though we were there from opening to closing on 2 days, we weren’t able to go on every ride. And yes, I always feel like a giddy little kid at Dland, it’s such a magical place. Wow that looks really cool I wish Tokyo’s had Andy’s Backyard! I love all the pictures, makes me feel I went 🙂 thanks for stoping by my blog~ your blog is really cool!! Thanks so much for your kind words! 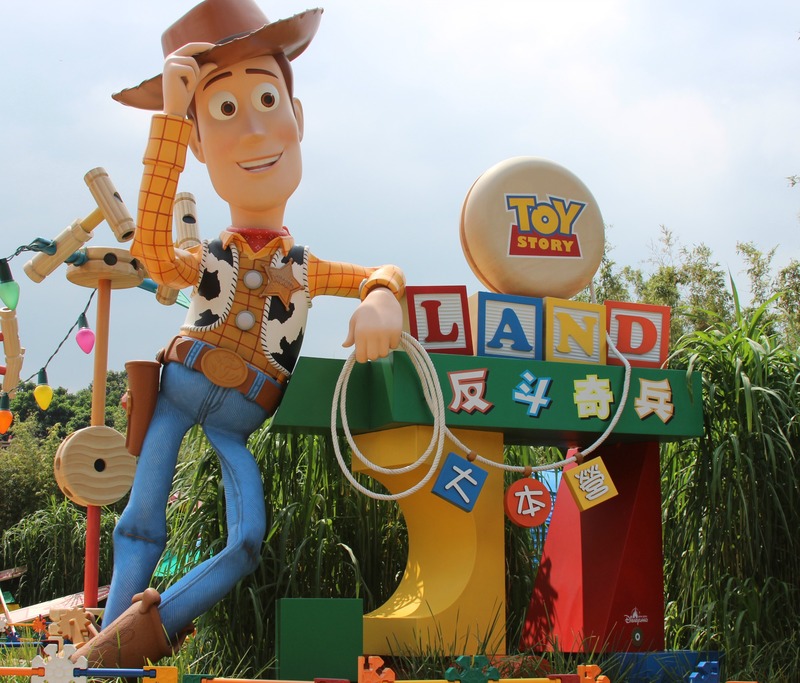 Yes, it would be nice if Tokyo Dland could get Toy Story Land too. I did enjoy seeing the new Toy Story Mania ride when I went. The exterior is spectacular! I love Disneyland HK. Although its small, but I get to really enjoy every single part of the park without rushing! I actually liked how compact the park was as well. The small size allowed us to finish everything in less than a day. And I really enjoyed the Runaway Mine Cars and Mystic Manor. It was so cool to be going on rides that are not found at any of the other Disney parks. Thanks so much for commenting! Congratulations on being nominated for the Blog of the Year 2013 award by the Half-Eaten Mind. Acceptance isn’t obligatory, but by giving this award to you I wish to show my appreciation for what you do. Thank you so much for this. It was really sweet of you to think about my blog, I’m both flattered and humbled. Just got back from HK but we skipped Disneyland because my wife doesn’t want to go on the rides. 😦 But the next time we visit HK, I’ll tell her that we can still have a good time even without going on rides. Thank you for sharing! That’s right, I remember that the two of you were going to HK in November! I hope you had a wonderful trip and I can’t wait to see your posts on all the places you ate at. I remember the food in HK being just wonderful, especially the dim sum and wonton noodle soup. Does Lyn get sick on amusement park rides? If so, I definitely sympathize. 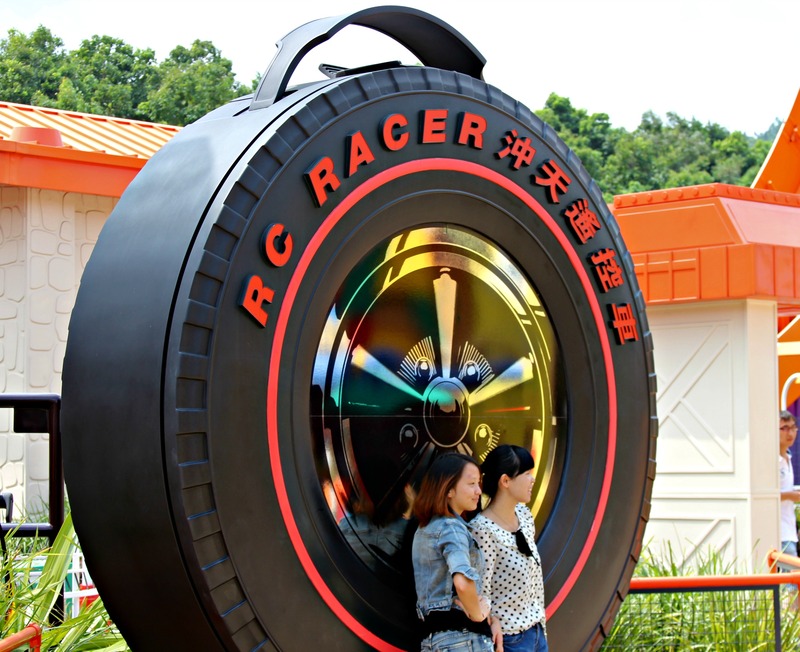 I remember a time when I used to love all kinds of rides, the faster the better, in fact. But as I get older, it gets harder and harder to go on certain rides. I got very sick from the Disneyland teacups a few years back. Oh thank you very much. It was very kind of halfeatenmind to nominate me for the award. But it means just as much to have you tell me that I have a great blog, I really appreciate it. We had a great time in HK and we ate at some of the restaurants/establishments that had queues: Tim Ho Wan, Tai Cheong Bakery (different branch from the one you visited) and Australia Dairy Company. Lyn can’t really ride much. I even had to help her ride the cable car to Lantau Island. But that’s ok by me since I get to save money ;-). You guys went to Australia Dairy Company, lucky! I wanted to go to there because I’d heard such great things but we ran out of time (as usual lol). But we managed to get to Tim Ho Wan (the branch at IFC in Central), their dim sum was so good, especially the BBQ pork buns. I’m also surprised that no one else commented on the high price of the crabs at the fish market. But maybe they’re not familiar with Japanese currency and don’t realize how expensive it is. Maybe it was a special kind of crab that’s only available in that region hence the high price. Crab is the one thing that I didn’t get to eat in Sapporo that was on my must-eat list. Somehow we just never managed to make it to the crab restaurant I really wanted to go to. So sad because I hear the crab there is not to be missed. Oh my goodness! This is wonderful! I really enjoyed these photos. I absolutely adore Rex, and it would be worth a visit just to see the giant statue. And those Scrabble tiles! Perfect! I am really envious of all your trips to Disney. I haven’t been since I was a kid, but I would love to go to any of the parks…especially Tokyo. Thank you! I love Rex too, I was delighted when he “talked”. And as a big Scrabble player I was also happy to see the tiles included as one of the toys. I love going to the Disney parks, I get such a magical feeling whenever I visit one. I hope you will get a chance to go to Tokyo’s Disney Resort someday. Their Disney Sea park is just spectacular and truly one of a kind.